Film Row was once home to major Hollywood film studio offices like Paramount Pictures and Warner Bros., but it has since been reborn into a mix of artistic businesses, restaurants and, of course, breweries and taprooms. The district is bound between Main Street, California Avenue, Walker Avenue and Classen Boulevard. Last October, alcohol in Oklahoma changed forever, with a change in laws taking us from Prohibition-era regulations to a modern age of freedom for local brewers. Breweries can now sell full-strength beers in supermarkets, keep them cold in liquor stores and allow underage guests in taprooms that can now also stay open until 2 a.m. Many local breweries actually surround the district, but they still attract patrons who might go to Film Row for 21c Museum Hotel or The Jones Assembly. 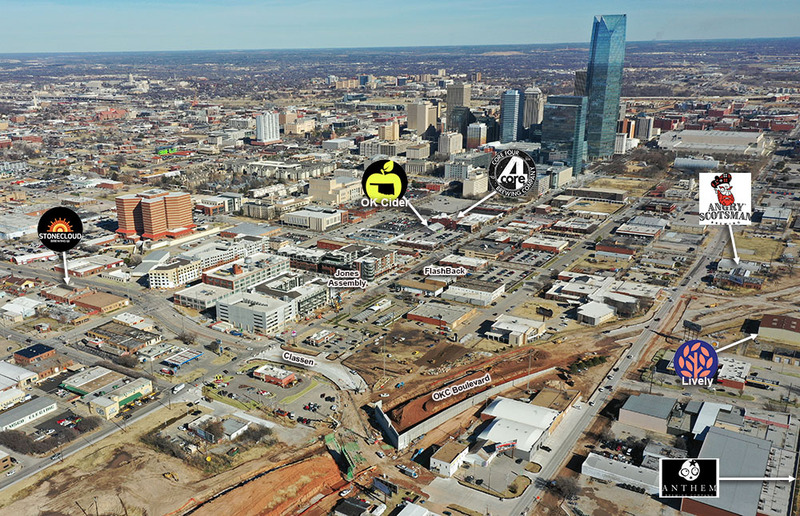 Three new breweries plan to open in Film Row District within the year: Core4 Brewing, OK Cider Co. and Lively Beerworks. Core4 will be in the historic Paramount Building, 701 W. Sheridan Ave., something co-founder Buck Buchanan said happened by pure luck. A friend told Buchanan that the Paramount had space available and things just “fell together” after that. Core4 is currently in the build-out phase, and Buchanan hopes to be open by spring. Core4 Brewing is under construction in the Paramount Building. OK Cider Co. is in a similar situation and almost the same location at 705 W. Sheridan Ave. The cider brewery is also in the build-out phase, and co-founder Tim King hopes to be open by mid-to-late spring. 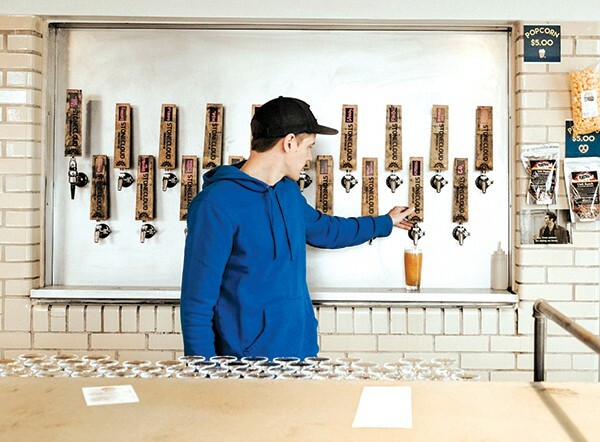 King and co-founder Luke Hadsall met in 2010 and started home brewing together. In 2012, King found out he was gluten-intolerant, so he moved away from beer and started drinking cider. He didn’t like most of them. So Hadsall made his first cider. He didn’t like it. Future home of OK Cider Co. Typically, cider is fermented apple juice with either wine, champagne or cider yeast, but King and Hadsall use beer yeast to give the cider beer characteristics. “A lot of times on cider, you get your flavor profile by mixing different types of apples. Instead of doing that, we’re using one single blend of juice and changing it up by the yeast we’re using,” King said. Patrick Lively recently signed a lease for Lively Beerworks at 815 SW Second St., about three blocks south from OK Cider Co. and Core4. Lively, who serves as board president for Craft Brewers Association of Oklahoma, started brewing professionally at COOP Ale Works before becoming president and head brewer of Anthem Brewing Company. But he wanted to start working for himself, and Lively Beerworks was the answer. The building is currently under construction. The plan is to complete it in two phases, Lively said. The first phase is to get the production side set up within the next three to four months. The second phase is the taproom, which Lively said will probably open in the summer. 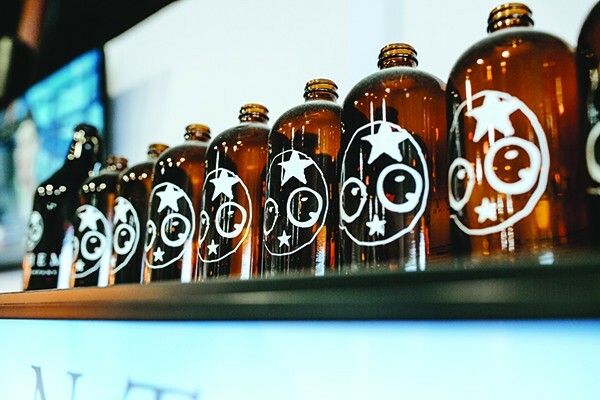 The three new breweries will join three already-established breweries serving the Film Row area. Lively said they are in a market that can support all breweries. Three breweries are already established in the area: Angry Scotsman Brewing, Stonecloud Brewing Co. and Anthem Brewing Company. 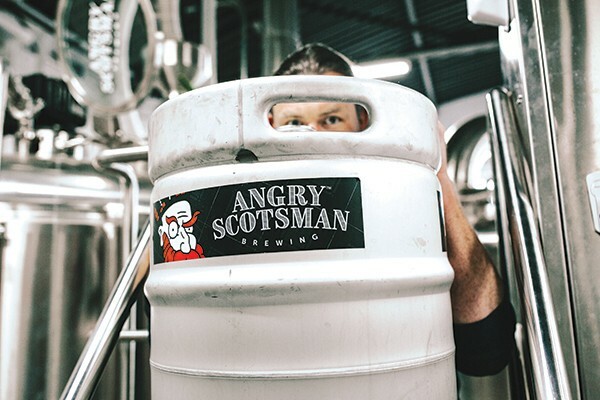 Angry Scotsman had its first commercial beer hit the market in late 2017 but only opened up operations last October. Its building at 704 W. Reno Ave. is right around the corner from the Lively Beerworks location. It is still under construction, but more than half of the building is open to the public, owner Ross Harper said. The building currently houses a completely functional brewery station, a patio area and a taproom. Harper hopes to fully open by March. Ross Harper, originally from Scotland, became known as the “Angry Scotsman” after telling his friends he was “pissed,” which can mean drunk or tipsy. Despite being “less polished” than other areas, Harper describes the Film Row area and west downtown as the “final frontier” because going north, south and east doesn’t hold as many development opportunities. Stonecloud is just north of Film Row in the historic Sunshine Building, 1012 NW First St., which was once home to laundry cleaners. The building was constructed in 1929 and sat vacant for 30 years after the cleaners closed in the 1980s. 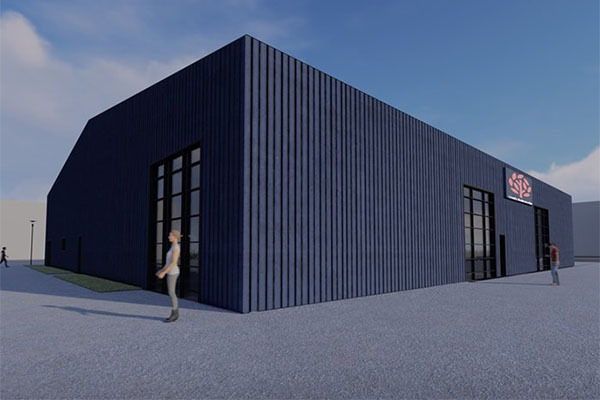 Owner Joel Irby, who opened the brewery in 2017, said the historic building helps sets Stonecloud apart from other breweries and businesses in the area. Despite some challenges in terms of location, Irby said he wouldn’t trade it for anything else. Anthem has occupied its building at 908 SW Fourth St. since 2012. It is the furthest brewery from Film Row in the area, standing about four blocks south of the district. But it still sees people make their way over before or after going out to Film Row, said Derek Duty, director of sales and marketing. Oklahoma had the third-largest growth in the number of craft breweries during the past four years, according to Forbes. The state had a 39 percent increase, bringing it to one brewery for every 100,000 residents of legal age. The Brewers Association currently lists 35 craft breweries in Oklahoma, 11 of which are in OKC. In 2014, there were only 10 in the entire state. Despite being in competition for similar crowds, brewers from each company say there is more than enough room for each brewery in the area to do what they do individually while working to succeed together. Harper doesn’t see the other five breweries as taking business away from him; he sees all breweries as part of the community. “I don’t want to take business from Stonecloud, I don’t want to take business from Anthem; I want to take business from big beer conglomerates,” he said. 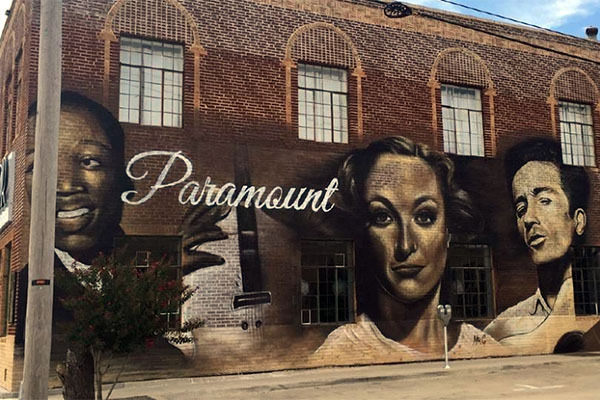 Because of all the breweries in the area and other developments taking place, Lively said Film Row has become a craft beer destination in Oklahoma that’s going to keep growing. Film Row continues to grow, with business and residential developments brewing throughout. The district, already home to FlashBack RetroPub, recently welcomed a religious-themed bar named The Sanctuary Barsilica. Both are owned by Jose Rodriguez, who has recently teased a third Film Row bar on Twitter. The massive West Village complex is being built in phases surrounding Jones Assembly and 21c Museum Hotel. First apartment tenants have moved into the building at the southeast corner of the development which will feature a total of 345 units when the entire project is complete later this year. Also in the first phase is the main office with a large workout facility, rooftop pool and other amenities. 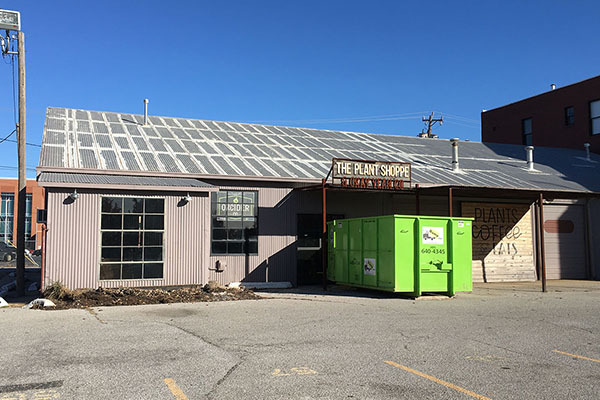 Soon to follow will be Stich Cafe, the Plant Shoppe and a general store called The Goods, all set for February completions. Access to the area will be greatly enhanced with the completion of the new Oklahoma City Boulevard later this year.